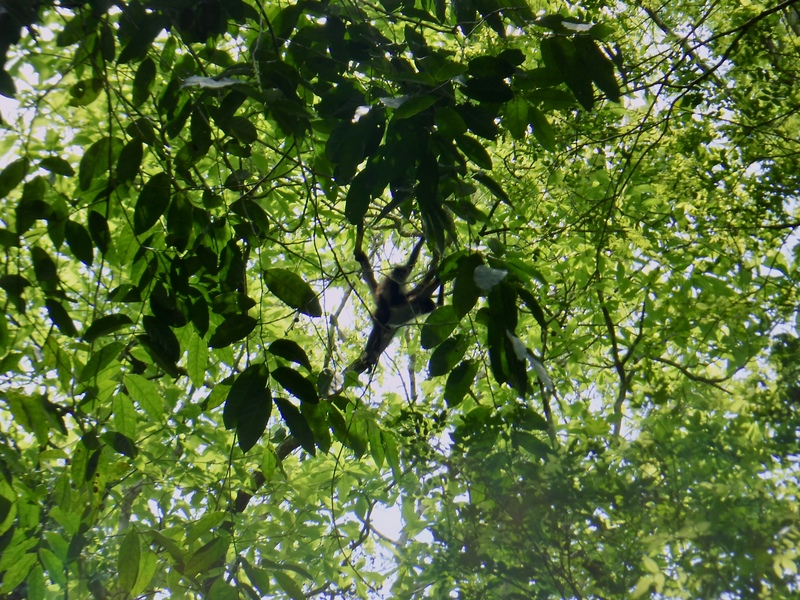 Two spider monkeys (Ateles geoffroyi) who paid us a visit on June 8, 2017. June 8, 2017 was a remarkable day. Once again, I worked at Structure 130. This turned out to be my favorite day at that site. Much of my field work during the previous two days involved painstakingly excavating around large rocks. We wanted to leave these stones in place, to figure out what sort of structure they might have composed. Today, I was finally given permission to remove them. Most of the rocks came out with little effort. However, one of them was wedged between a large tree root and several other stones. This meant I had to pound its side with a rock hammer in order to dislodge it. The 5-year-old in me rejoiced at being able to hit something. After removing many of the rocks from this unit (Unit D, described here), we found a layer of plaster. The plaster was mixed in with numerous pebbles, and our team leader speculated that it might have been Maya cement. Maya cement is fascinating technology. The Classic Maya used to construct circular kilns full of carefully-stacked wood. According to author and Maya researcher Leonide Martin (2016) The kilns were approximately 2 meters (6.6 ft) tall and about 6 meters (19.7 ft) across, with an open shaft in the middle. This shaft encouraged cool, oxygen-rich air to flow into the kiln after it had been lit, heating limestone that had been placed inside the kiln to temperatures of 1450-1600 degrees Celsius (2642-2912 Fahrenheit) (Martin, 2016). At those temperatures, the limestone underwent a chemical reaction that created “hydraulic cement” (O’Kon, 2012). The Classic Maya would then combine this substance with water, pebbles, and other materials to form Maya cement. This ancient Mayan technology was every bit as strong and advanced as the Portland cement in use today, even though it was developed at least 1500 years earlier (Martin, 2016; O’Kon, 2012). But for me, finding Maya cement was not the most exciting occurrence of June 8. 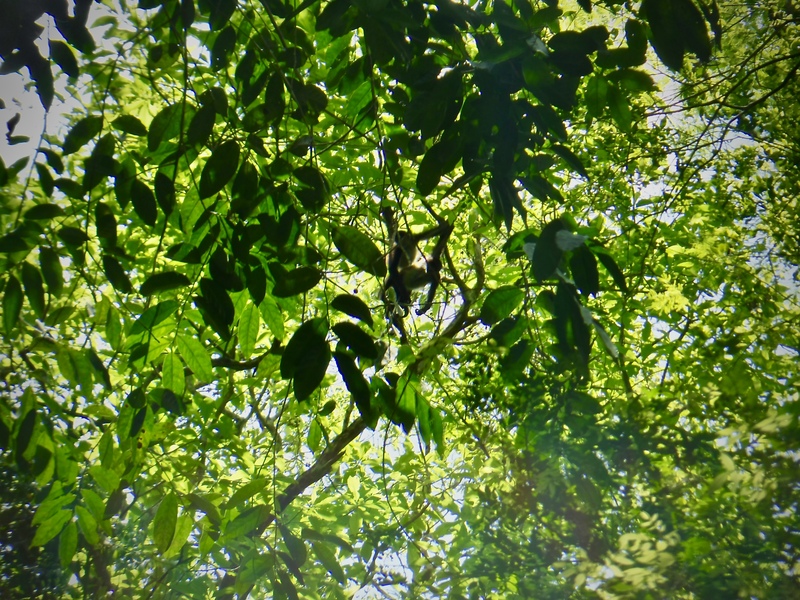 While working at Structure 130, two spider monkeys (Ateles geoffroyi) payed us a visit. Spider monkeys are often aggressive towards humans in the Rio Bravo Conservation and Management Area: throwing sticks and occasionally peeing on them. But these monkeys were peaceful. They sat in a nearby tree for much of the afternoon, calmly watching us work. It was a magical encounter. Another shot of the spider monkeys who came to visit us on June 8, 2017. As with most days, June 8 was not perfect. In the evening, one of my fellow Humboldt State students asked me what I did before joining the archaeology field school. Her innocent question stirred a number of insecurities I had been struggling with. For those who are unaware, before embarking on my current path I was enrolled in a mental health counseling program at Cleveland State University. I sometimes wonder if I should have stayed there. If I had, I would be done with school and in the early stages of a career as a counselor. I would be earning money, instead of continuously going further into debt. My classmate’s inquiries woke those doubts from hibernation, and they attacked me with renewed vigor. Another troubling event on June 8 involved a spider. Morgan, a student from the University of Texas at Austin, showed me a remarkable spider in Texas Camp’s latrines. It was the largest spider I had ever seen, and it had hundreds of babies on its back. Fortunately, June 9 would prove to be one of the most exciting days I spent with the Program for Belize Archaeological Project. I admit that spiders make me uncomfortable, and that I often squash them when they show up in my room. So yes, I’m probably being hypocritical. I think what bothered me about the event I described in this post was that we were so clearly in the spider’s room, instead of the other way around. The latrines in camp were completely open to the jungle, with no doors. So I had a hard time seeing how the spider deserved to die. But like I said, I know that I’m being hypocritical. I didn’t think you were, I was just rambling :) Thanks for commenting! Apart from that, I understand your feelings about choices, yet I think you made a far more interesting one. My ex, I thought would be an interminable student, is now currently in Abu Dhabi, teaching and leading an enviously interesting life. So there’s that. I would give anything to be doing what you’re doing. I’m sure it is punctuated at times, with questions of “Why am I here?” but overall your blog proves fascinating to those of us who will never get the chance you have now. I think it was the person’s comment that bothered me the most. Saying the spider “deserved to die” seemed ridiculous to me. Also, thanks for the encouragement! I hope that I’ll be able to take advantage of more exciting opportunities in the near future, and share with you all what I learn. very interesting post, as always!! Thanks Leyla! I’m heading into the part of the trip that gets really interesting soon. You are doing something close to your heart and not everyone gets that choice. Cheers!